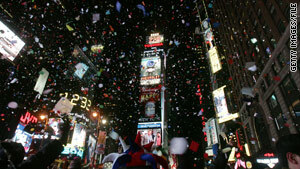 Confetti rains down on New York's Times Square on January 1, 2009. (CNN) -- Americans will usher in the new decade less hopeful than they were at the dawn of the millennium in 2000, says a new national poll. In 1999, 85 percent of Americans surveyed said they were hopeful about their own future, and 68 percent said they were hopeful for what the New Year boded for the world. The survey polled 1,160 Americans. The margin of error is plus or minus 4.5 percentage points.